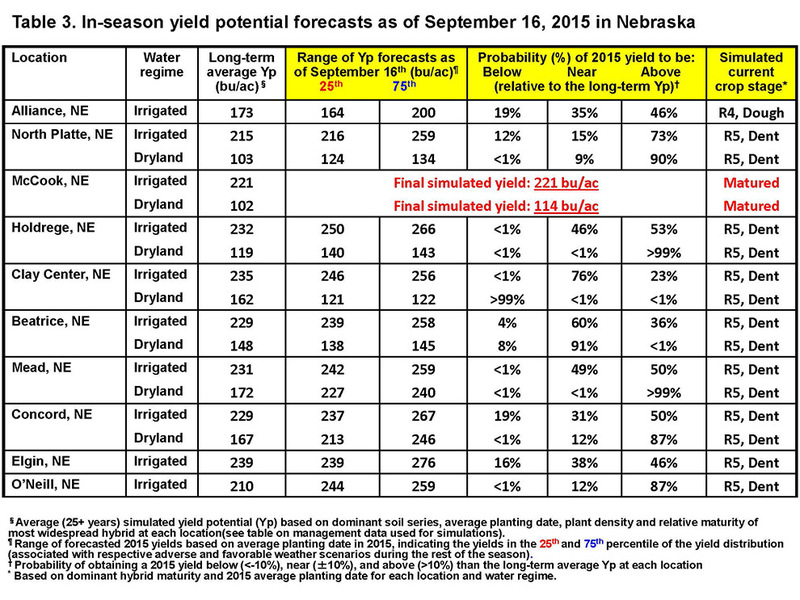 See corn yield projections, as of Sept. 16, for these sites in Tables 3-5. Corn is approaching black layer in most of the Corn Belt and has already reached maturity at many locations in Missouri, Kansas, and Illinois. The range of forecasted yields has continued to narrow since the Sept. 2 forecasts. During the last two weeks, daytime and nighttime temperatures have been above normal throughout the Corn Belt, which has accelerated corn development. To evaluate changes in projections of 2015 end-of-season corn yield potential, additional simulation runs were performed Sept. 16 for the same 45 locations (Figure 1) using the UNL Hybrid-Maize model and in collaboration with faculty and extension educators from 10 universities. Details about Hybrid-Maize and the underpinning methodology to forecast end-of-season yields, as well as on interpretation and uses of yield forecasts, can be found in a previous CropWatch article. Briefly, the Hybrid-Maize model simulates daily corn growth and development and final grain yield under irrigated and dryland conditions. The model estimates "yield potential," which is the yield obtained when the crop is not limited by nutrient deficiencies, diseases, insect pressure, or weed competition — conditions that represent an "optimal management" scenario. It also assumes a uniform plant stand at the specified plant population and no problems from flooding or hail. Because weather, soil, and management factors are "location-specific," Hybrid-Maize simulations are based on actual weather data, soil, and typical management practices at the location being simulated as provided by university agronomists, extension educators, and DuPont Pioneer Agronomists in each state (see Tables 1-2). The results for simulation of end-of-season yields as of Sept 16 are shown in Tables 3-5. The crop has reached black layer at all irrigated sites in Kansas, Missouri, and southwest Nebraska. Final simulated yields are within ±10% relative to the long-term yield. At those locations where black layer has not yet occurred (South Dakota, Wisconsin, and most of Nebraska), final yield is likely (above 80% probability) to be near or above average. In dryland corn, black layer was reached at 16 locations, mostly in Illinois, Kansas, and Missouri. 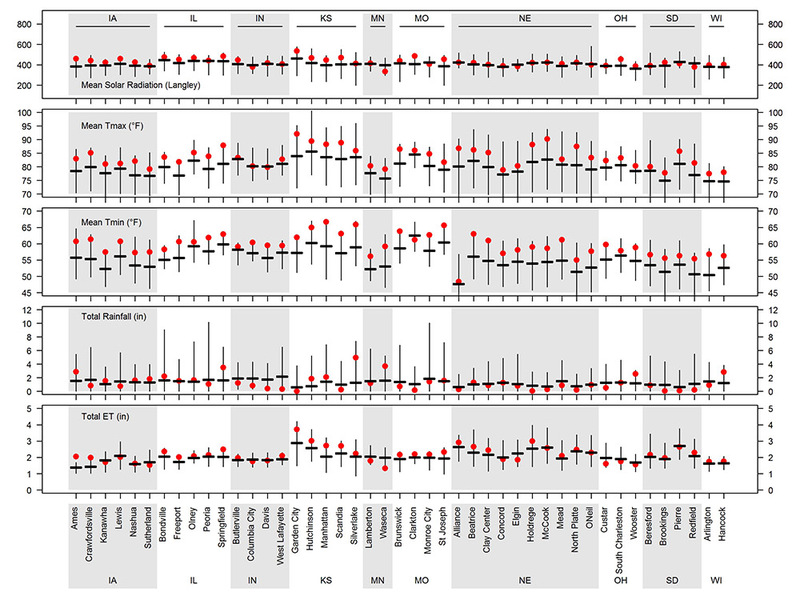 At 10 of these locations, final simulated yield was higher (> 10%) than the long-term average. The rest of the matured crops are projected to have near average yields. Indeed, the general yield scenario looks very favorable at the other 29 locations where maturity has not been reached yet. At half of these sites, there is a high (more than 85%) probability of above-average yields, while yields are projected to be near average at the remaining sites. Overall, probability of below-average dryland yield across the Corn Belt is very low unless unusual yield-damaging weather conditions (e.g., hail) or disease occur before the crop matures. Below average yield are projected for only two sites (Clay Center, Nebraska and West Lafayette, Indiana) due to deficient rainfall during the last 30 days (<1.2 inches). A summary of recent weather conditions [daily solar radiation, maximum and minimum temperature, total rainfall, and total reference evapotranspiration (ET)] for Sept. 2-15 is presented in Figure 2to help with the interpretation of the forecasted corn yields. Vertical bars indicate the range for these variables based on 20+ years of weather records. The horizontal thick line indicates the long-term average while the red dots indicate 2015 averages. Temperature during the first two weeks of September were above normal across the Corn Belt and, on average, daytime and nighttime temperatures were 4°F above their historical averages for this time of year. Rainfall and ET have remained close to normal throughout the region, with few exceptions. Figure 3a. 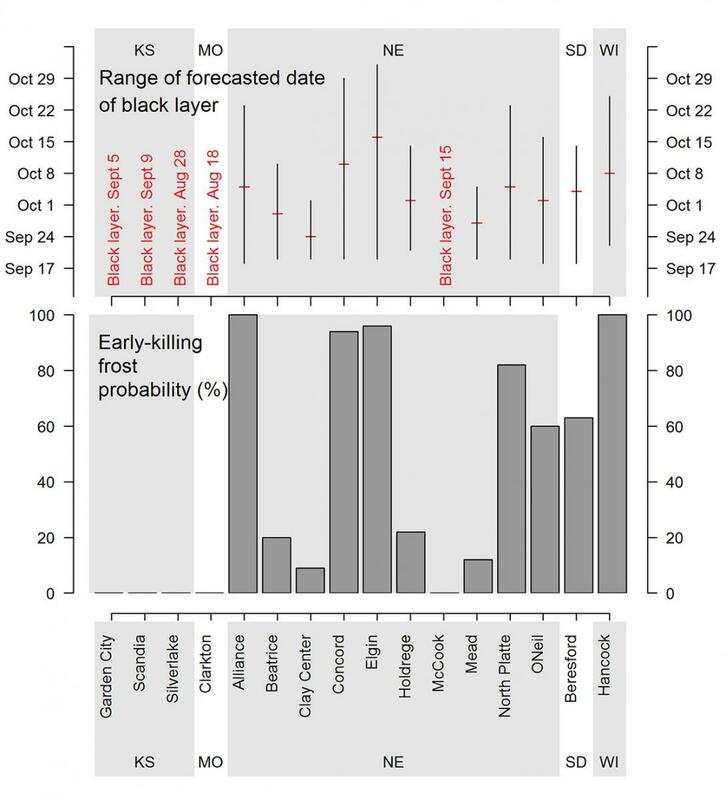 Range of forecasted dates of black layer and probabilities of an early-killing frost for dryland sites used in this model. Figure 3b. 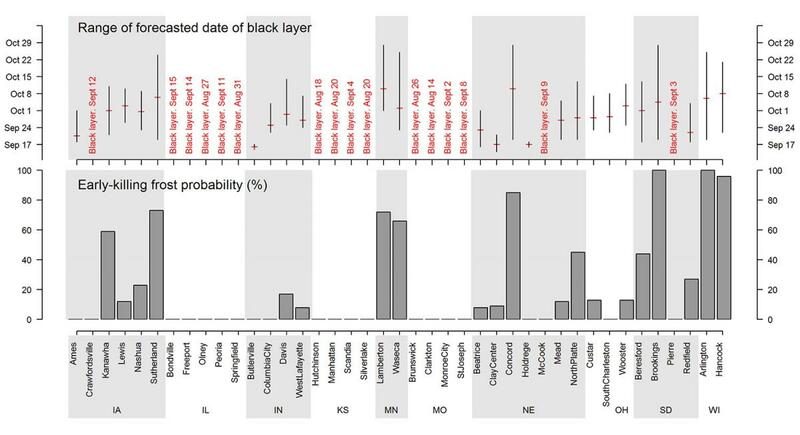 Range of forecasted dates of black layer and probabilities of an early killing frost for irrigated sites used in this model. Range of forecast dates of blacklayer at each location, for both irrigated and dryland crops, can be seen in Figure 3. For all corn sites that have not reached maturity, black layer is likely to occur during the last week of September or the first week of October, depending upon local temperatures during the coming weeks. Probabilities of early-killing frost at each location can be seen in Figure 3. The good news is that the probability of an early-killing frost decreased since the Sept. 2 forecast at several locations, due to warmer temperatures that hastened crop development. However, probability of early-killing frost is still high (>66%) in Wisconsin, Minnesota, South Dakota, norther Iowa, and northern and western Nebraska. If frost occurs, its timing will ultimately determine the magnitude of yield impact. For example, little yield reduction is expected if frost occurs just a few days before the predicted black layer date. This may be the case for most locations across the Corn Belt. It should be noted, however, that an early-killing frost can have other negative impacts besides yield reduction, including low test weight, high moisture content, increasing drying cost, and combine losses due to stalk breakage and diseases. With few exceptions, the yield scenario looks favorable for dryland and irrigated corn in the Corn Belt, with yields projected to be near or above-average at a majority of the locations. While it is still uncertain whether irrigated yields will be near or above average, dryland yields are likely to be well above average in (at least) 50% of the sites. These forecasts do not take into consideration problems with stand emergence due to crop residues, hail/flooding damage, replanting situations, disease/insect issues, or nutrient deficiencies. Likewise, there can be late-season diseases and high winds or hail events that can cause yield loss as the crop matures or awaits harvest. Therefore, in fields negatively affected by these constraints, actual yields will be lower than estimates provided herein. We will follow up with further forecasts (or end-of-season yield if crop has already matured) by early October.